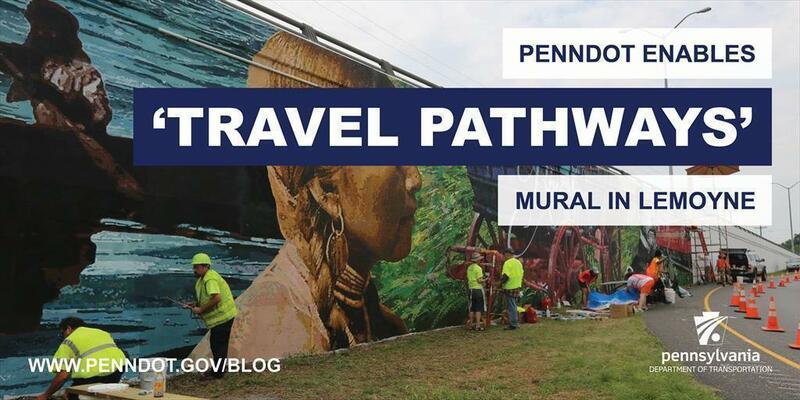 The "Travel Pathways Through Lemoyne's History" mural project, planned by the Lemoyne Borough, is the first of its kind in the region to use a state transportation facility as its canvas. PennDIOT's District 8 is pleased to have partnered with borough officials to realize the project along a retaining wall for the Interstate 83 ramp known as the Lemoyne exit. PennDOT appreciates the research and great care that artist Daniel Finch took to depict the local history of the borough, from its earliest days as Bridgeport to its current days as Lemoyne. The mural captures all forms of transportation, from canoes to wagons and trains and airplanes — a true multimodal experience as one winds their way along the exit ramp and into "the little town that has it all." Time, effort, and years of planning went into the mural project. Coordination efforts between the borough’s design sub-committee and District 8 were well thought-out and effective in communicating the needs and concerns of all parties involved.